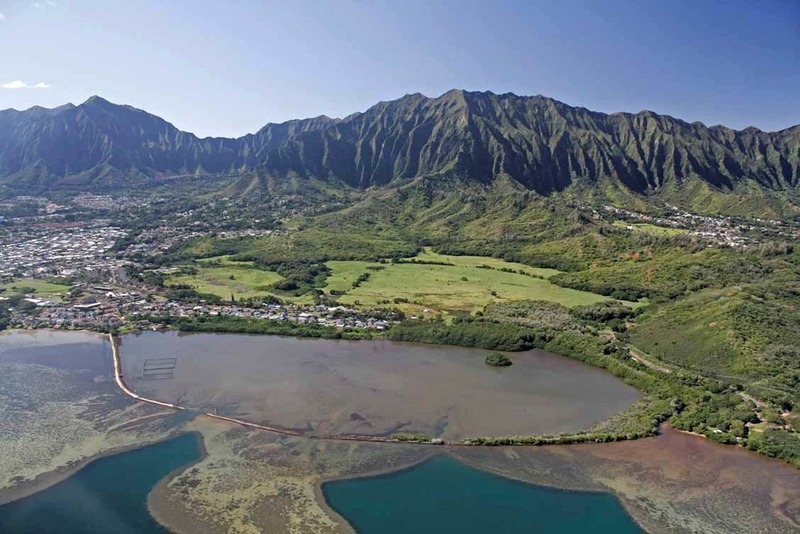 Hawaiian Fishpond Restored | Thousands of people, including Hawaii Gov. David Ige, turned out to place the final rocks and coral in an 80-foot hole in the wall of He‘eia Fishpond on the morning of Saturday, Dec. 12. Many of you may know of this fishpond as it is near some wonderful Bonefish flats on the East side of Oahu. The final push in the yearlong Pani Ka Puka campaign, this one-day event brought together more than 2,000 people from various parts of the community, from families to schools to hula hālau to organizations that included Hawaiian Airlines, Waipā Foundation on Kauaʻi, Bonefish Hawaii, The Nature Conservacy, Kākoʻo ʻŌiwi and The Kohala Center on Hawaiʻi Island. Even the governor, dressed in a royal blue T-shirt and baseball cap, came out and passed buckets of rocks as part of a human chain from the mauka edge of the fishpond all the way out to the puka (hole) on the far end. Many of the volunteers including Bonefish Hawaii had donated to the campaign, which was launched last December by the nonprofit Paepae o He‘eia to fix and restore the 800-year-old fishpond. The organization, which serves as a steward of the historic fishpond, raised more than $100,000 for materials and labor to fix this puka. “This is not the end. This is only the beginning,” says Mahina Paishon Duarte, a co-founder and first executive director of Paepae o He‘eia. “We want to make this pond momona (fertile) again. We want to grow fish and seaweed here again.” The magnitude and scale of this event, organizers say, hasn’t been seen on O‘ahu in more than 200 years. Hawaiian Fishpond Restored. To learn more about this fishpond, visit paepaeoheeia.org.